I am building a ground-level deck using 2x8 joists. The deck height will be determined by a concrete stoop near the door. I plan to place 2x4 sleepers flat on top of the stoop and tie them in to the framing. Currently, I plan to use headers as the beams. Two 2x8s will lay on the piers using post bases, with 1/2" plywood to fill the remaining space in the post base. Joists will hang between the headers and the ledger board. The problem with this is that the top of the piers will be exposed and visible. Is there a way to move the piers away from the perimeter so they won't be visible? There isn't enough vertical space for a typical beam that would go under the joists. Someone suggested that I place the piers under the joists, but this didn't make sense to me. Any way to move the piers to the inside of the deck for a low deck? Another benefit to this is that the length of the joist would be adjustable. With the fixed headers resting directly on piers, I am committed to a joist length, which means that I may have to rip the last deck plank to fit. With an internal beam, I could place full planks from the ledger. As I approach the outside edge, I could cut the cantilevered joists to the proper length to fit full planks. A separate question involves the use of a rim joist attached to the house to eliminate a corner pier. The deck will be on an inside corner of the house. The ledger will be attached to one wall. One of the rim joists will be attached to the other wall (is rim joist still the correct term here?). The width of the deck (in the direction that the joists run) will extend about one foot beyond the edge of the house. Rather than placing a pier in this corner, would the rim joist attached to the house support this corner? The rim joist (2x8) would be attached to the house for about 9 feet, with about one foot cantilevered beyond the end of the house. Thanks in advance to all who read or respond. You have touched on a great question when it comes to building a ground level deck as low as possible so that the beam or header as you have referred to is within the plane of the joists themselves. In other words, the top of the joists is level with the top of the beam. The joists are going to be connected to the beam by joist hangers. So you ask if there is a way of hiding the piers that the beam rests on and there is. I am going to provide a drawing of a simple framing technique that you and the readers can refer to as one suitable and fairly simple solution. 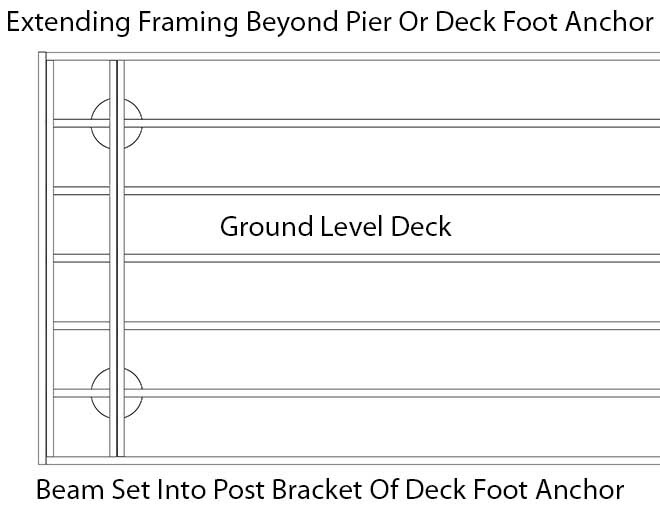 Here is a diagram showing how you can build a ground level deck by hanging the joists from the sides of the beam in order to minimize elevation. Normally this exposes the piers to view. However if you extend the beam (cantilever it beyond the pier) and you lengthen the outside joists and frame the rim joist with 10" or so blocking joists you can make the deck frame go beyond the piers and still have a strong platform. Thanks for the great tip! Your diagram shows this method over a relatively short distance, hiding only two footings. What if there are many footings to hide over a long distance? I imagine the further apart the outside joists get from each other, the bouncier the cantilevered portion will be between them (due to the joist hangers and flush beam). Your are right. If you had a 16' long distance and an 18" cantilever with only blocking it will be weaker in the middle. However, when using this technique you are just trying to hide the footing so all you need is a 6" to 12" cantilever maximum. At those dimensions you will not have a bouncy area at all. Remember, this if for cosmetic purposes. How to attach the rim joists to the beam? I was debating about the advantages of this method vs. the extra cost/work. Then I showed the drawing to my wife and there is no debate; she wants the piers hidden. What hardware would I use for these changes? Even though the rim joists are being supported by the beam rather than supporting it, I would think that I would use a double-wide joist hangar where the rim joists meet the beam. And an inside corner where the headers meet the rim joists? Yes a double joist hanger would be very good to use at the ends of the beam to provide even more support to the rim joist that projects beyond the beam. Remember you do not have to project or cantilever much more than ten or twelve inches to achieve the effect you are looking for. You can just use screws or nails for where the headers meat the joist at the inside corners. There is not really any specialized connector that I can think of for that. That looks like an awesome solution that will both hide the piers and allow me to use an integral number of planks by leaving the cantilevered joists a bit long, then cutting them to the desired length as the planking gets near the end. Do I want the joists meeting the beam directly over the piers? I had planned to place the piers between joists, thinking that the hardware used to attach the beam to the pier (I had planned to use a post base) would get in the way of a joist hanger. No you do not have to have the joists lined up over the piers. In fact it is most likely that they will not align. But you can locate them where you wish. It will be easier as you suggested.